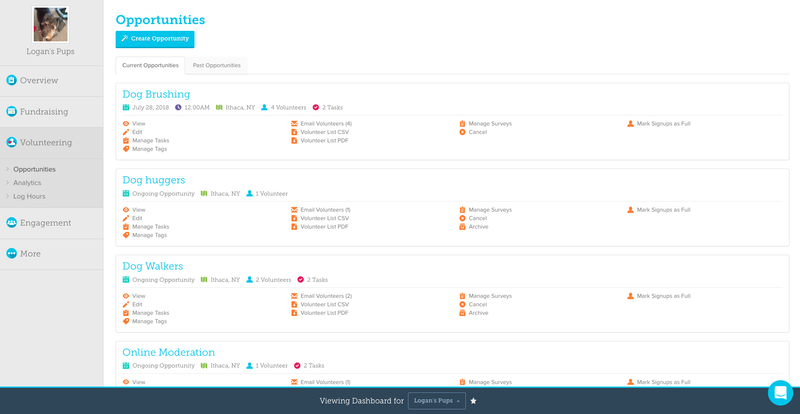 The Overview Tab is where you'll automatically land when you arrive at your organization's Admin Dashboard. 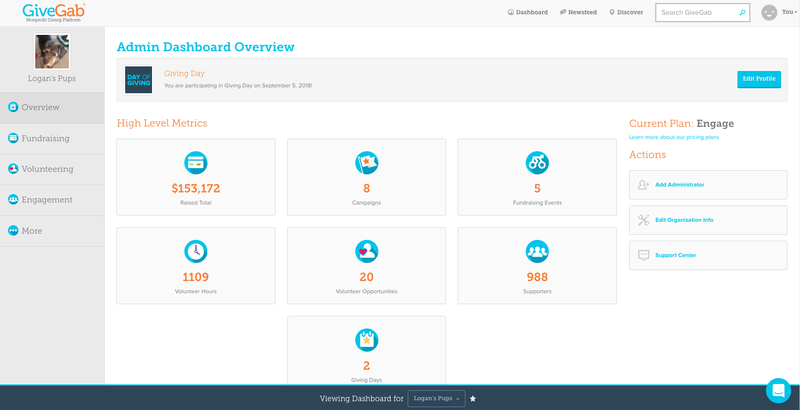 From the Overview Tab, you’ll be able to get a general overview of all your organization’s engagement on GiveGab. By clicking on any one of these overview buttons you'll automatically be directed to the corresponding section of your Admin Dashboard. Total Dollars Raised: An overview of all your dollars raised on GiveGab that takes you directly to your Donations Dashboard within the Fundraising Tab. Fundraising Campaigns: An overview of the total number of fundraising campaigns you've run on GiveGab that takes you directly to the Campaigns Section of the Fundraising Tab. Fundraising Events: An overview of the total number of fundraising events you've run on GiveGab that takes you directly to the Events Section of the Fundraising Tab. Volunteer Hours: An overview of the total number of volunteer hours logged to your organization on GiveGab that takes you directly to the Analytics Section of the Volunteering Tab. Volunteer Opportunities: An overview of the total number of volunteer opportunities your organization has posted on GiveGab that takes you directly to the Opportunities Section of the Volunteering Tab. Supporters: An overview of the total number of supporters your organization has on GiveGab that takes you directly to the Supporters Section of the Engagement Tab. From this tab you can also add additional administrators, edit, and view your organization's GiveGab profile. 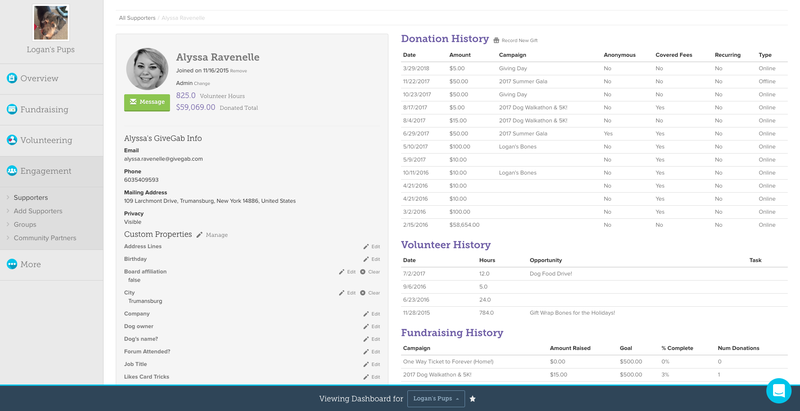 Within the Fundraising Tab you can toggle between four different sections: Donations, Donation Form, Campaigns, Events, and Giving Days. Donations: here you can manage and edit your organization's Donation History on GiveGab. Donation Form: here you can customize your organization's general donation form and thank you message on GiveGab. 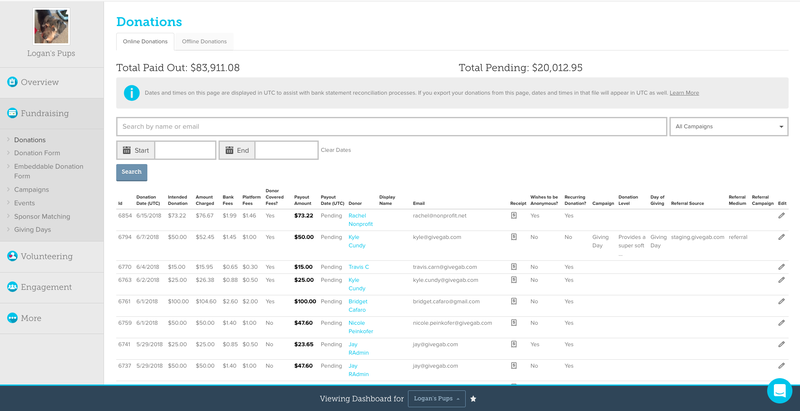 Campaigns: here you can view, edit, and manage any current or past fundraising campaigns or create a new one. Events: here you can view, edit, and manage any current or past fundraising events or create a new one. Giving Days: here you can view, edit, and manage your organization's Giving Day profile. 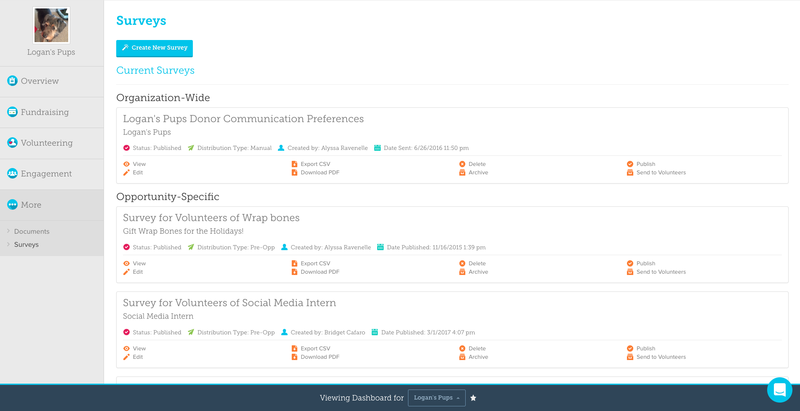 Within the Volunteering Tab you can toggle between three different tabs: Opportunities, Analytics, and Log Hours. Opportunities: here you can manage, edit, and create volunteer opportunities for your organization. Analytics: here you can view advanced analytics around volunteer hours logged to your organization on GiveGab. Log Hours: here you can log hours for your supporters on GiveGab. Within the Engagement Tab you can toggle between four different sections: Supporters, Add Supporters, Groups, and Community Partners. Supporters: here you can add, message, and manage your supporters on GiveGab. This is also where you can access GiveGab's enhanced supporter tracking and engagement tools. Add Supporters: here you can add supporters to your organization and invite them to sign up for GiveGab. Groups: here you can create, edit, and manage sub-groups within your organization on GiveGab. Community Partners: here you can add and manage your organization's community partners on GiveGab. Within the More Tab you can toggle between two different sections: Documents and Surveys. Documents: here you can add different documents to your organization's GiveGab profile that your supporters will be able to access. Surveys: here you can create, edit, and manage any surveys you create on GiveGab.